2018 started much like 2017 finished – running! In effort to win the title of “Most Boring Person of the Year” I found myself going to bed on New Year’s Eve at 10.30 pm after only two glasses of wine in preparation for the New Year’s Day Parkrun! I was that smug person at the starting line feeling fresh as a daisy, ready to run 5 and a bit laps of Highbury Fields as fast as I possibly could! Before I started working with my coach I posted a 5k race time in August of 25mins and 8 seconds which is about 10 seconds slower than I would normally expect to come in. The New Year’s Day Parkrun was my fourth one of this plan, and each one has seen significant improvements in my time. This first Parkrun of the year was no exception with another 35 seconds coming off my best time, bringing me for the first time ever, under 23 minutes at 22:57. Suffice to say, I was that smug person at the finish line too! It’s very satisfying to see the hard work in training pay off and it makes each week of early morning runs in the dark worth it. Parkruns are such a good way to get out there and have other runners spur you on. I love the fact that anyone can take part, whether you walk, jog or run. You’re not competing against each other, just yourself and it’s all for free. Long may this organisation continue. As the remaining runs of the second phase of the plan were ticked off I started mentally preparing myself for what Phase 3 might have in store for me. This is the phase where the weekly mileage really starts to increase in order to build my endurance for the actual event at the end of March. I wasn’t sure what to expect so I was pleasantly surprised when I saw that my heaviest week was only 56 miles. That was exactly what I thought it might be, and given that’s only 10 more miles than my heaviest weeks of Phase 2, mentally, that feels entirely manageable. No one week increases by more than 10%, ensuring that my body can cope and I don’t burn myself out… as long as I work hard at hitting my slow run paces, which I’ve not been very good at! My biggest concern through all of this training is how my body will respond. In 2016 I was out for 6 months when my knees simply refused to run any more. When I first saw a physio I was told there was a big chance I wouldn’t be able to run more than 4 miles at a time – not what a regular runner ever wants to hear! Weekly physio appointments, acupuncture and lots and lots of physio exercises over that period pieced me back together but ever since I have always been careful to listen to my body and be on the watch out for warning signals. 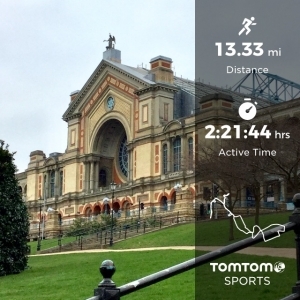 So far so good, but I have been aware of a slight niggle in my left Achilles tendon which is a hangover from the Hackney Half Marathon last May. I still go to my amazing Osteopath once a month for what I call a service so the first week of Jan I got her to take a close look to reassure me. After a bit of manipulation and acupuncture in some very tender areas she gave me the all clear saying it was fine, just very tight. However, the niggles have continued and started to increase slightly so with that in mind I booked myself in for a sports massage after my Saturday 8 mile run. For anyone who has never had a sports massage, the best way to describe it is “a form of 1 hour torture that you pay for”! The benefit of a sports massage is that it goes deep into the muscles, working into the tissue to loosen up any tension and tightness, which in turn can help prevent potential injuries, and in my case, lighten the load on my Achilles. It certainly wasn’t a comfortable experience but the benefits were clear the very next day when the end of week 11 required a 13 mile run across a hilly route. 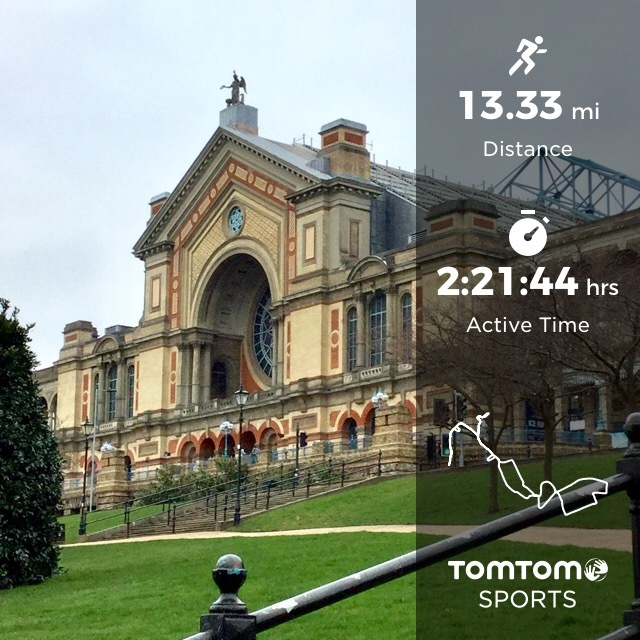 Taking it slowly, I headed out on my usual route of Finsbury Park, up to Crouch End, a detour to Alexandra Palace to get the mileage up and then on to the beast that is Muswell Hill. This still wasn’t far enough so I plodded on through Muswell Hill and up to Highgate making a mental note of the distance for next week when I will need to do the similar route but find another 2 miles of hills to reach 15 miles. Having reached Highgate I turned around and headed home knowing that the direct route would get the remaining 4 miles needed and only one more steep hill. But getting home isn’t the end of it. There’s the 10 minutes of warm down stretches, 10 – 15 minutes of exercises on the foam roller, and then another 10 – 15 minutes of precautionary icing. Only then can you think of a shower and putting your feet up for a while. And then before you know it, it’s Sunday night, and it’s time to head back to work the next day, and start the next intense week of training. No rest for the wicked – not until Easter anyway!